Sample was removed from -20C and spun @ 4C, 16,000 x g for 30mins. Supe removed, pellet washed with 1mL 70% EtOH and spun @ 4C, 16,000 x g for 15mins. Supe removed, tube spun briefly and remainder of EtOH removed. Pellet was resuspended in 100uL of 1x TE and spec’d. Sample will be run on a gel according to JGI instructions. The only thing that could be worse about this gel would be no sample DNA. 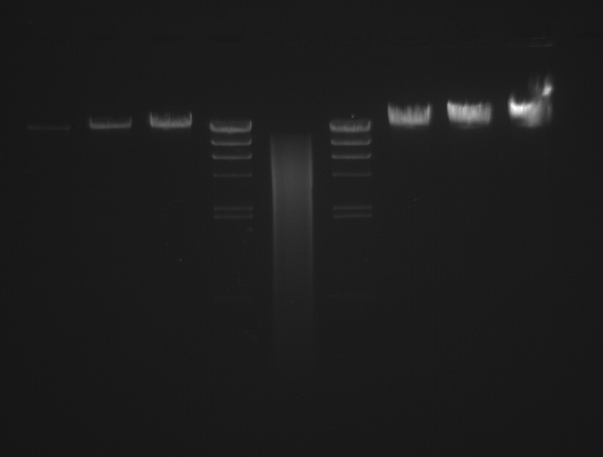 However, what we see here (the giants smear in middle of the gel is our sample) is completely degraded OR sheared gDNA. That means this gDNA is absolutely useless now. Will start growing more cultures for another massive gDNA isolation. This entry was posted in Miscellaneous and tagged Cycloclasticus pugetii, DNA, EtOH precipitation, gel, JGI on 26 August, 2009 by kubu4. Precipitate DNA from 20090526 to concentrate and run on gel for resubmission to JGI to see what happens. 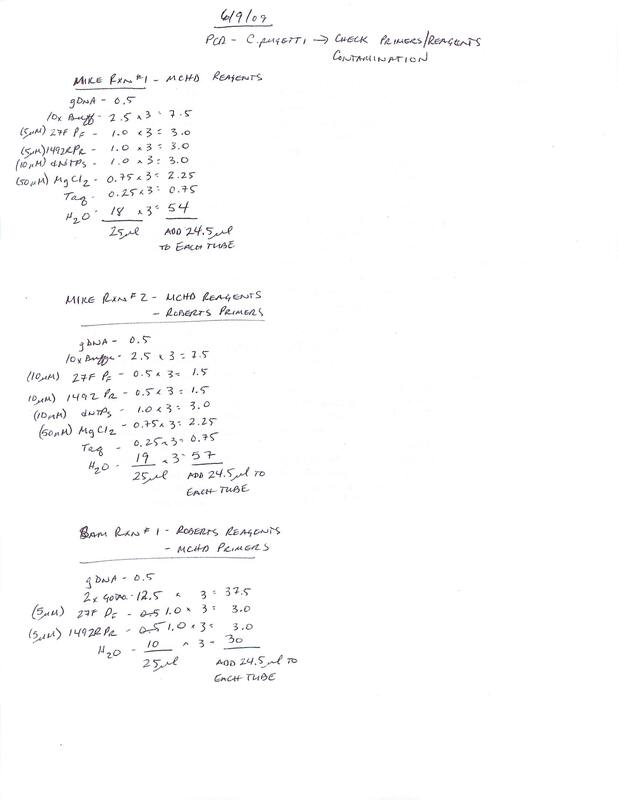 Added 0.1 volume of 3M sodium acetate, pH = 5.2 (40uL) and 2 volumes of 100% EtOH (880uL). Mixed throughly and incubated O/N @ -20C. This entry was posted in Miscellaneous and tagged Cycloclasticus pugetii, DNA, EtOH precipitation, JGI on 25 August, 2009 by kubu4. 1L liquid culture (grown for 10 days) was split into two UV-sterilized bottles. Cells were pelleted in a Sorvall T21 centrifuge using the bucket rotor for 30mins @ 4200RPM, 4C. Supe was removed and bacterial pellets were stored @ -20C. This entry was posted in Miscellaneous and tagged bacterial culture, Cycloclasticus pugetii, JGI on 23 July, 2009 by kubu4. One of the three starter liquid cultures from 20090706 wee used to inoculate 1L of Marine Broth + biphenyl. Incubated 200RPM @ 28C. This entry was posted in Miscellaneous and tagged bacterial culture, biphenyl, Cycloclasticus pugetii, JGI, marine broth on 13 July, 2009 by kubu4. A recent email from JGI indicates that they are satisfied with the quality of DNA (as seen on 20090601), however their estimate of the gDNA concentration (42ng/uL) means that we have ~16ug of DNA. They requested 50ug. Based on the gel, their calculations are reasonable. However, the NanoDrop suggests that are sample is ~1350ng/uL! So, I’ve respec’d the sample and did a few dilutions to see how it looked. Results: The undiluted sample is approximately the same concentration as initially reported. A 1:1 dilution produces the expected concentration of half the undiluted. The 1:10 and 1:100 dilutions deviate a bit from the expected concentrations, but are reasonably close. I still don’t know how to explain the discrepancy between what the gel analysis suggests vs. the NanoDrop spectrophotometric data. This entry was posted in Miscellaneous and tagged Cycloclasticus pugetii, DNA Quantification, gDNA, JGI, NanoDrop1000 on 6 July, 2009 by kubu4. Inoculated 3 x 5mL Marine Broth + biphenyl crystals (UV sterilized) cultures from frozen stock in 50mL Falcon tubes. Incubated 200RPM, 28C. Will use these are starter cultures to inoculate larger cultures. This entry was posted in Miscellaneous and tagged bacterial culture, biphenyl, Cycloclasticus pugetii, marine broth on 6 July, 2009 by kubu4. This is a repeat of yesterday’s PCR due to the presence of bands in the water-only samples. Will use reagents and universal 16s bacterial primers (27F & 1492R) provide by the Horner-Devine lab in hopes of: 1) getting this two work and, 2) figuring out the source of the contamination. All rxns were prepared sterily and all instruments, racks, tubes, tips and water were UV-sterilized for ~45mins in the biological hood. Rxns were prepared in the biological hood. PCR setups are here. Anneal 60C. Cycling params same as yesterday. This entry was posted in Miscellaneous and tagged 1492R, 16s, 27F, Cycloclasticus pugetii, gDNA, gel, gel extraction, PCR, Ultrafree-DA on 9 June, 2009 by kubu4. Previous PCRs from 20090601 & 20090602 both showed contamination in the negative control. Suspect that the primer stocks were contaminated due to the usage of older, non-sterile TE for reconstitution. New stocks were received and reconstituted with filter-sterilized TE. Working stocks were made with filter-sterilized Nanopure H2O. All pipettes, tips, tubes, racks were UV-sterilized in the biological hood. The PCR reaction was set up in the biological hood. PCR set up is here. Used universal 16s bacteria primers (27F, 1492R). 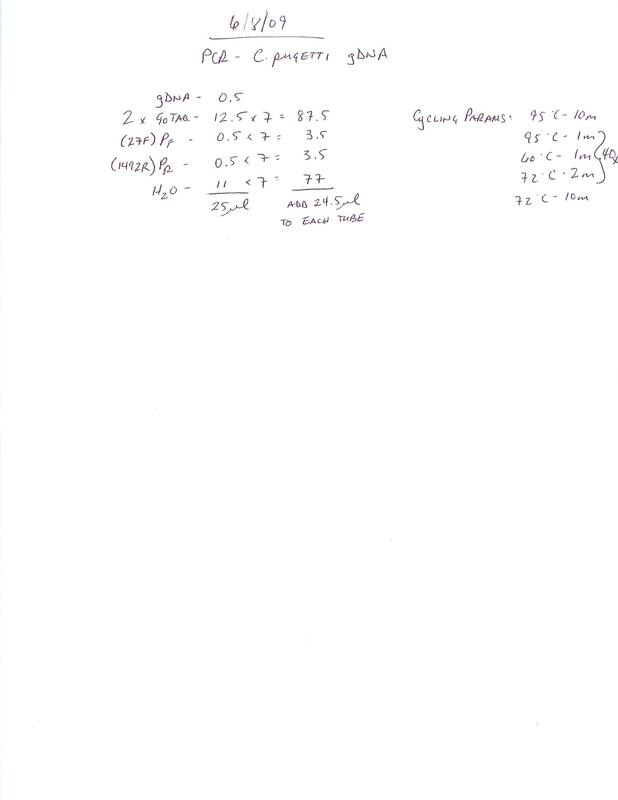 Sequences from Sara Kelly. Anneal 60C. Results: Still contamination in the water-only samples!!! This entry was posted in Miscellaneous and tagged 1492R, 16s, 27F, Cycloclasticus pugetii, gDNA, gel, PCR on 8 June, 2009 by kubu4. Inoculated 1x 1L of MB + biphenyl crystals from frozen stock. Incubated 28C, 200RPM. MB was autoclaved with the biphenyl crystals. This entry was posted in Miscellaneous and tagged bacterial culture, biphenyl, Cycloclasticus pugetii, marine broth on 5 June, 2009 by kubu4. This is a repeat of yesterday’s PCR with a fresh working stock in hopes of eliminating the source of contamination seen in the negative control yesterday. Results: Same problem as yesterday. Water sample is contaminated. This suggests that the primer stocks are contaminated. Likely due to the use of non-sterile, “old” TE for reconstitution of the primer stocks. Will re-order them and reconstitute them sterily. This entry was posted in Miscellaneous and tagged Cycloclasticus pugetii, gDNA, gel, PCR on 2 June, 2009 by kubu4.